Great Things Grow Here | Experimental Design By David Trubridge. Experimental Design By David Trubridge. Great Things Grow Here / Innovation / Experimental Design By David Trubridge. Waka, seating furniture to drift away on. Waka is designed by David Trubridge who, in his second collaboration with Offecct, has created an inviting, open piece of seating furniture. It is a place for meetings or rest where we can let our minds drift away for a moment. Waka looks like it has approached the floor and stopped in a serene smile. The form triggers curiosity but doesn’t immediately signal how it should be used. With an inviting structure, open seating is instead offered which is the result of an advanced design which New Zealand designer David Trubridge has refined over different stages of his career. “The inspiration for this furniture goes all the way back to the ’70s when I studied to become a naval architect. This furniture is derived from the lines in boat construction and resembles something that floats, something dreamy that you can drift away on,” says David Trubridge. The body of Waka is barely three metres long with a broad centre and narrow ends, which gives it character and space enough for several people to use at the same time. An upholstered surface with a characteristic quilt pattern covers the structure of the furniture. Waka is therefore just as easily arranged in an open landscape in a public environment as it is placed in a lobby or reception area as a beautiful centrepiece. 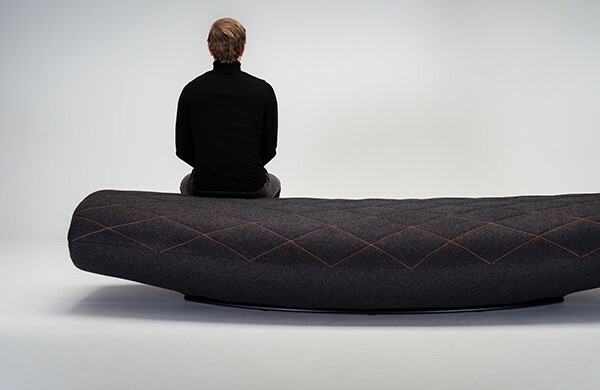 “This is a play between industrial construction and handicraft, which means that it lies at the core of what Offecct is known for furniture that is as beautiful as it is functional,” says Anders Englund, Design Manager at Offecct.